The account of the brother of Jared seeing the finger, and then the spirit body, of the premortal Jesus Christ, is well known to readers of the Book of Mormon. What may sometimes go unnoticed is the extensive use of temple imagery throughout this visionary account in Ether 3. Moroni described the event in language that recalls the revelatory experiences of other prophets, such as Moses and Isaiah, and also that of the high priests who officiated in the ancient Israelite temple. This language indicates that Moroni likely viewed the brother of Jared’s experience as parallel to the temple worship that would be performed among the Israelites and Nephites. Several elements of the brother of Jared’s visionary experience resemble descriptions of the work of ancient prophets and priests, especially in the context of the ancient Israelite temple. The brother of Jared, for example, had 16 shining stones, comparable to the 16 precious stones the high priest wore on his priestly vestments. He was able to pass through, or see within, the veil, as did the high priest in the temple rituals. 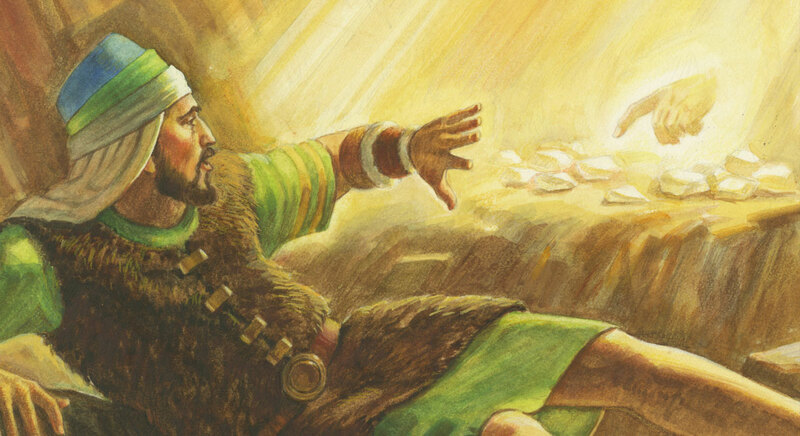 He saw the Lord, as did ancient prophets, priests, and kings (see table for further details and examples). Many points stand in common between what ancient Israelite high priests did in temples—and similarly, what prophets did on high mountains—and the account of what happened to the brother of Jared found in Ether 3. Why would Moroni describe this event in words that are so reminiscent of ancient temple ceremonies and rituals? There are, generally speaking, many parallels between the various temple/visionary accounts of this type throughout the scriptures. Individuals blessed to participate in a temple/mountain visionary experience are often taken through the same processes and shown similar things. Similarly, former BYU professor of religious education M. Catherine Thomas has insightfully suggested that “the brother of Jared received his endowment on the top of mount Shelem.”13 It is possible that Moroni understood this to be the case, based on his awareness of similar mountain-top or temple experiences of prophets like Nephi in 1 Nephi 11 and of the people at the temple of Bountiful in 3 Nephi 11, and that he deliberately emphasized the concepts that would lead readers to recognize parallels between the brother of Jared’s experience and the rites and ordinances of the temple. Indeed, the Lord himself told the brother of Jared that these things would come forth in the Lord’s “own due time” (Ether 3:24, 27). This points to a time when a fullness of eternal truths regarding the gospel of Jesus Christ, the house of the Lord, and the ordinances of salvation and exaltation would be restored and revealed again to mankind. M. Catherine Thomas, “The Brother of Jared at the Veil,” in Temples in the Ancient World: Ritual and Symbolism, ed. Donald W. Parry (Salt Lake City and Provo, UT: Deseret Book and FARMS, 1994), 388–398. Kent P. Jackson, “’Never Have I Showed Myself unto Man’: A Suggestion for Understanding Ether 3:15a,” BYU Studies 30, no. 3 (1990): 71–76. 1. Cf. Isaiah 27:13; 56:7; 65:11; Psalm 24:3; 68:15–16; Zechariah 8:3; Revelation 21:10; 1 Nephi 11:1; Moses 1:1. 2. See M. Catherine Thomas, “The Brother of Jared at the Veil,” in Temples of the Ancient World: Ritual and Symbolism, ed. Donald W. Parry (Salt Lake City and Provo, UT: Deseret Book and FARMS, 1994), 388–398. 3. The high priest had two stones on his shoulders, twelve on his breastplate, and two in the “pouch” of the ephod (the Urim and Thummim) = 16 stones. It is also interesting to note that ancient traditions regarding the Urim and Thummim describe them as “shining” or emitting light. Josephus indicated that the stones on the priestly vestments functioned by “bright rays” shining out from them (Ant. 3:8 § 9). See also Book of Mormon Central, “KW 240: Why Did the Brother of Jared Believe Stones Could Shine? (Ether 6:3),” KnoWhy 240 (November 28, 2016). 4. Lynn and Hope Hilton, “The Hand as a Cup in Ancient Temple Worship,” in Discovering Lehi: New Evidence of Lehi and Nephi in Arabia (Springville, UT: Cedar Fort, 1996), 171–177. 5. See, e.g., Edward Curtis and Albert Madsen, A Critical and Exegetical Commentary on the Books of Chronicles (Edinburgh: T&T Clark, 2001), 331–332. 6. John W. Welch, “The Temple in the Book of Mormon: The Temples at the Cities of Nephi, Zarahemla, and Bountiful,” in Temples of the Ancient World, 366; Donald W. Parry, “Garden of Eden: Prototype Sanctuary,” in Temples of the Ancient World, 126–151. 7. See Alex Douglas, “The Garden of Eden, the Ancient Temple, and Receiving a New Name,” in Ascending the Mountain of the Lord: Temple, Praise, and Worship in the Old Testament (2013 Sperry Symposium), ed. Jeffrey R. Chadwick, Matthew J. Grey, and David Rolph Seely (Provo, UT: Religious Studies Center, Brigham Young University; Salt Lake City: Deseret Book, 2013), 39–41. 8. Cf. Judges 13:20; 1 Samuel 5:3–4; Matthew 2:11; Mark 5:22; Luke 5:12; 8:41; 17:16; Revelation 5:8, 13–14; 7:11; 11:15–17; 19:2, 4. For further reading, see Matthew L. Bowen, “‘They Came Forth and Fell Down and Partook of the Fruit of the Tree’: Proskynesis in 3 Nephi 11:12–19 and 17:9–10 and Its Significance,” in Third Nephi: An Incomparable Scripture, ed. Andrew C. Skinner and Gaye Strathearn (Provo, UT: Neal A. Maxwell Institute and Deseret Book, 2012), 107–29; Matthew L. Bowen, “They Came and Held Him by the Feet and Worshipped Him”: Proskynesis before Jesus in Its Biblical and Ancient Near Eastern Context,” Studies in the Bible and Antiquity 5 (2013): 63–89; Book of Mormon Central, “Why Did the People Fall Down at the Feet of Jesus? (3 Nephi 11:17),” KnoWhy 202 (October 5, 2016). 9. See also Matthew 27:51; Mark 15:38; Luke 23:45; 1 Corinthians 13:12; Alma 19:6; Ether 12:19; D&C 38:8; 67:10; 101:23; 110:1; Moses 7:61. 10. See Matthew B. Brown, The Gate of Heaven (American Fork, UT: Covenant Communications, 1999), 138–139; John Eaton, Festal Drama in Deutero-Isaiah (London: SPCK, 1979), 17–18, 42–43; Stephen D. Ricks, “Liturgy and Cosmogony: The Ritual Use of Creation Accounts in the Ancient Near East,” in Temples of the Ancient World, 118–125. 11. Leviticus 8:8; Numbers 27:21; Deuteronomy 33:8; 1 Samuel 2:18; 14:41; 23:6, 9–13; 28:6; 30:7–8; Ezra 2:63; Nehemiah 7:65; Hosea 3:4; Sirach 45:10; Mosiah 8:13–18; Alma 37:1–3; Abraham 3:1, 4. 12. Neal A. Maxwell, Lord Increase Our Faith (Salt Lake City, UT: Bookcraft, 1994), 78. 13. Thomas, “The Brother of Jared at the Veil,” 397.